The animated short is one of the oldest examples of filmmaking and many leaps in the technology of film occurred in animation. For decades, animated shorts accompanied feature films, be they Disney's Mickey Mouse or Warner Bros. Looney Tunes. In my earliest memories, I recall seeing cartoons before movies. However, that practice died out as theaters wanted to show more trailers before movies. Then about 20 years ago, Pixar brought the medium back and suddenly, we anticipated a new short with every Pixar release. Showing the bizarre relationship which exists between Pixar and their partner Disney, Disney began adding shorts to their films. In 2007, Pixar released a volume of its shorts on Blu-ray Disc, with a second volume following in 2012. Now, once again somehow trailing behind, Disney brings us the Walt Disney Animation Studios Short Films Collection on Blu-ray Disc. How does this set compare with the output of Pixar? "John Henry" (2000) (10 minutes) -- This is a re-telling of the famous legend of a man who goes up against a steam engine to prove who is better. This is notable in that it doesn't shy away from the notion that Henry had been a slave. The animal style is interesting as the opening is made to look like quiltwork and this is the rare short which feels like a full-blown musical, but are we supposed to be able to see the animation lines which weren't erased? Other than pieces from the 50s, I've never seen anything like that. Lorezno (2004) (5 minutes) -- This is the tale of a fat, spoiled cat whose bragging gets the best of him. The tone of this is like a darker version of a Looney Tunes short. The chalk-like and day-glo animation is eye-catching. The Little Matchgirl (2006) (7 minutes) -- OK, that was the most depressing thing that I've ever seen. Thanks Disney. This adaptation of a Hans Christian Anderson story, which focuses on a young peddler who is trying to survive in the harsh elements, is beautifully rendered, but good God is it a downer. If you are watching this with young children, you may want to skip this one. How to Hook Up Your Home Theater (2007) (6 minutes) -- This is an odd mixture of modern technology and Disney shorts from the 1950s, as Goofy hooks up his new television system. It also has the same sort of humor as those old shorts (and, of course, the famous Goofy scream). There is a noticeable amount of grain and video noise here. Tick Tock Tale (2010) (6 minutes) -- One of the more creative pieces found here, it features a self-loathing clock which finds a way to become a hero. Very cute and of all of the shorts found in this collection, this feels the most like something from Pixar. Prep & Landing Operation: Secret Santa (2010) (7 minutes) -- Following their debut in a 2009 TV special, Disney really tried to force this duo down our throats, but they never quiet caught on, did they? Here Wayne (voiced by Dave Foley) and Lanny (voiced by Derek Richardson) help Mrs. Claus with a secret mission. This features fairly standard CG animation. The Ballad of Nessie (2011) (6 minutes) -- Narrated by Billy Connolly (who else?) this short shows how The Loch Ness Monster deals with a developer building a miniature golf course near her home. Very reminiscent of classic Disney shorts, this introduces us to the very cute McQuack. Tangled Ever After (2012) (6 minutes) -- Following the events of Tangled, Pascal the chameleon and Maximus the horse are in charge of the rings at the wedding of Rapunzel and Ryder. Of course, wackiness ensues and this serves as a nice post-script to the film. Paperman (2012) (7 minutes) -- This is a great example of what can be done using only visuals. The nice black & white animation combined with the sweet story make this tale of one man's use of paper airplanes to attract a woman's attention a winner. Great depth here, as the characters are nicely separate from the backgrounds. Get a Horse! (2013) (6 minutes) -- In an attempt to meld the old with the new, this starts out looking like a very old Mickey Mouse short, but when Mickey falls out of the frame, he finds himself in our 3D world and has to fight his way back in. This is a clever idea, but it gets redundant very quickly. Feast (2014) (6 minutes) -- Another story told mostly through visuals, here we have a dog which comes to love human food and then learns the ways of love. Short and charming, this uses cel-shaded animation, which looks like cardboard cutouts at times, to hold our interest. Frozen Fever (2015) (8 minutes) -- This shows us what happened after Frozen. As Elsa, Kristoff, Sven, and Olaf set up for Anna's birthday party, Elsa comes down with a cold, and wackiness ensues. This appeal for most will be the new song with Menzel and Bell. I couldn't help wondering if the whole thing was meant to be an odd homage to David Cronenberg's The Brood. There is one funny Olaf moment here. Walt Disney Animation Studios Short Films Collection proves that sometimes shorts aren't short enough on Blu-ray Disc courtesy of Walt Disney Studios Home Entertainment. This collection presents a mix of video quality. Most of the shorts are letterboxed at 1.78:1, save for the last three, which are 2.35:1. The major issues with video quality have been noted above. Most look fine, sporting good colors and details. The 1080p HD transfer runs at an average of 35 Mbps. The Disc carries a DTS-HD Master Audio 5.1 track which runs at 48 kHz and an average of 3.6 Mbps. The track provides clear dialogue and sound effects. I didn't note any real shift in audio quality here, as the tracks real good across the board. As one would expect, the latter ones did offer more detailed surround sound. 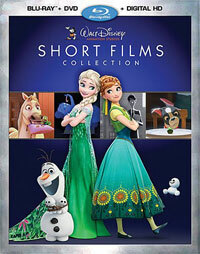 The Walt Disney Animation Studios Short Films Collection Blu-ray Disc contains only a smaller number of extra features. Each short is accompanied by a video introduction by the filmmakers involved. These act as small behind-the-scenes featurettes. Although they only last about a minute each, they feature some concept art and clay models which illustrate how the piece came about. "@Disneyanimation: The Short Story About Shorts" (7 minutes) has T.J. Miller chatting with the various makers of the shorts about the medium and how shorts are made at Disney.